Possibly the only model in the Rolex catalog to out-iconic the Submariner, the Cosmograph Daytona has become an institution in the world of luxury watches, and the yellow gold Rolex Daytona is no exception. A product of everything that was best about the sixties, the Daytona was born in motor racing’s romantic heyday and the golden age of Hollywood cool. Housing high functionality inside timeless classic design, it has transcended its heritage as the archetypal driver’s watch to become a striking expression of success and status. Like the most accomplished models from the Swiss watchmaker, the Daytona has resisted radical upgrades over its more than 50-year lifetime—there is, for example, no Daytona II. Outwardly at least, it remains largely similar to the first watch launched in 1963. While yellow gold versions have dropped in and out of fashion for decades in favor of white or Everose, it remains the king of the precious metals. 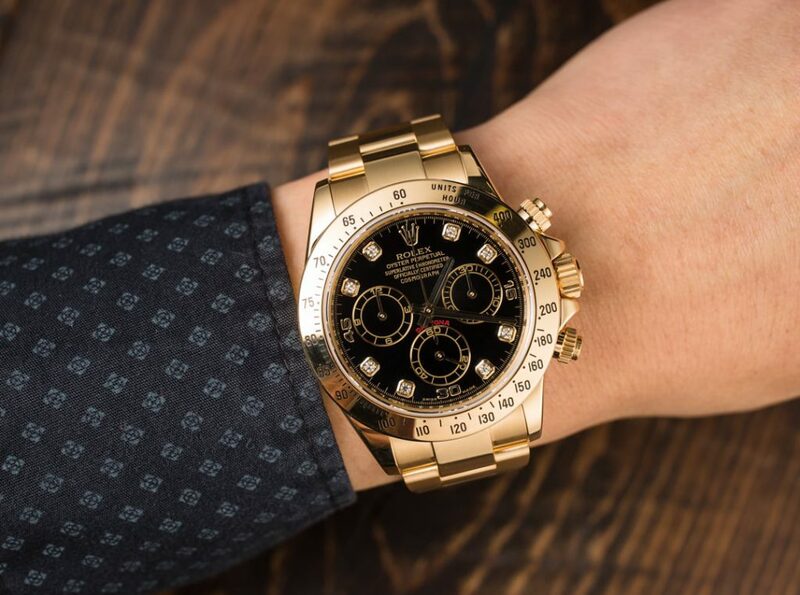 Rolex offer yellow gold Daytona watches in a vast array of different styles; from subtle, sporty cases on Oysterflex bracelets to lustrous all gold showstoppers complete with diamond indexes. As an eye-catching display of luxurious style, a yellow gold Rolex Daytona remains unrivaled. Unusually for Rolex, they were late to the game for chronographs and their first abortive attempts to crack the market were lukewarm at best. Other watchmakers had been making them better for longer. It wasn’t until they debuted the reference 6239 in 1963 that they experienced their first taste of success, the year after they became official timekeeper at the Daytona International Speedway. Briefly named the Le Mans Chronograph, their new creation soon adopted the moniker of the famous racing circuit to appeal more to an American audience. Even more out of the ordinary for the brand, the Daytona didn’t get its own in-house caliber till 2000. For 40 years it relied on that most un-Rolex of items—a third-party movement, albeit a highly modified one. The first examples used the manual winding Cal. 72 chronograph from the legendary Swiss manufacturer Valjoux. Customized by Rolex, adding in particular the company’s own shock-absorption device, it was renamed the 72B. Even so, the Daytona struggled to find its audience when it was first launched, and it took movie star royalty to save it. In much the same way as the Explorer II owes a huge debt of gratitude to Steve McQueen’s patronage, the Daytona’s fortunes were transformed overnight thanks to a certain Paul Newman. When wife Joanne Woodward bought the actor a ref. 6239 to commemorate the start of his motor racing career, the watch started its climb towards being one of the most sought after pieces ever made. It’s said the actor wore the watch every day until his death in 2008. The unobtrusive variations on the watch face, known as ‘exotic dials’, that mark out the range of Paul Newman Daytonas see examples change hands among collectors for truly mind-blowing amounts of money. An extremely rare lemon dial specimen, in yellow gold, recently sold for over $3.5 million. And in October, that original ref. 6239 gift goes up for auction in New York—we’ll let you know! In 1988, Rolex borrowed another chronograph movement, this time the self-winding El Primero from Zenith, for the second series of Daytonas. After some heavy modifying, the caliber actually retained fewer than half its original parts and was fitted with a new escapement and balance spring with Breguet overcoil. Gone was the date function and the balance’s oscillation rate was dropped to 28,800 bph to increase power reserve and require less frequent servicing. This new reference, the 16520, saw the Daytona start to emerge as a status symbol rather than the functional tool watch it had always been. A larger 40mm case and lacquered dial surfaces added to the luxurious feel, and the sub-dials were ringed in contrasting colors, giving the watch a dynamic presence. Now much more than a highly useful chronograph, it became the watch to be seen with. Instantly successful in the decadent 80s, waiting lists soon stretched into years, with Rolex struggling to keep up with demand, hampered as they were by the use of outside manufacturers for the movements. With the new century, Rolex finally introduced their own caliber into the Daytona, the 4130, paring down the number of internal components to improve reliability. However, constructing their movements in-house has done little to cut the wait time, and it takes either a lot of patience or a close personal friend as a dealer to get your hands on a new watch quickly, especially the steel models. The precious metal versions can be had quicker, due mainly to their higher price and correspondingly lower demand. Rolex isn’t shy about introducing new styles for their flagship chronograph. Recent years have seen a host of Daytonas in everything from Everose to platinum, with yellow gold making up almost exactly half the range. Like all the metals that go into their watches, the yellow gold used in the Daytona is smelted in Rolex’s own foundry deep underground, Bond villain-style, at their Plans-Les-Ouates base just outside Geneva. 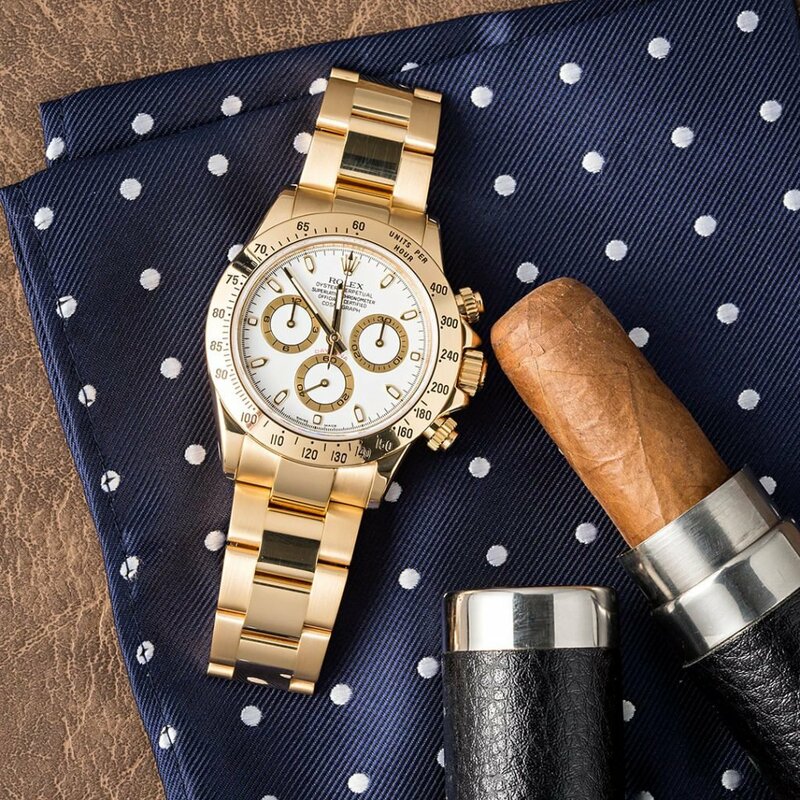 Today, yellow gold Daytonas can be had in a variety of styles versatile enough to appeal to a wide audience, provided they have sufficiently deep pockets. The 18K golden case and bracelet of the ref. 116528 is available with dials of black, white and mother of pearl, along with Rolex’s signature green. Diamonds also replace the hour markers on some versions for the ultimate in arresting opulence. Far more sporty and true to its racing roots is the ref. 116518LN released this year at Baselworld, a beautifully sleek timepiece on the innovative Oysterflex bracelet and with a black Cerachrom bezel that harks back to the John Player Special Daytona from the 1960s. In between is the ref. 116503, a mix of yellow gold and Rolex’s ultra strong 904L steel for the best of all worlds. The Cosmograph Daytona has been an unqualified success story for Rolex and one of the most important sport watches of all time, due to the brilliance of its design and the quality of its manufacture. Being Butch Cassidy’s favorite wrist adornment didn’t hurt either. 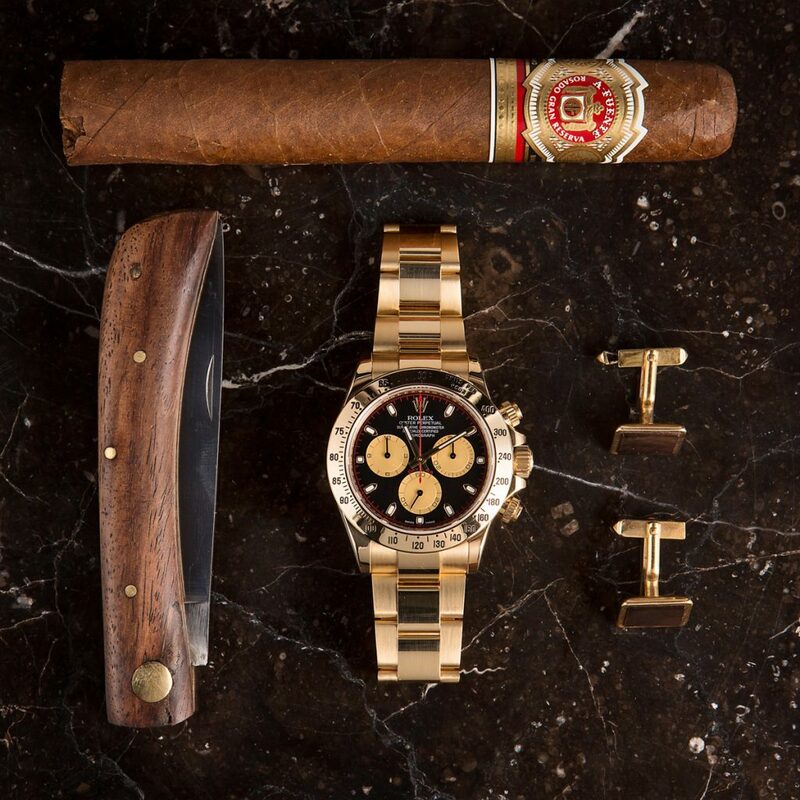 The yellow gold Rolex Daytona variations are an impeccable blend of form and function, a tough as nails performer inside an exquisite piece of jewelry, intended for those only content with the very best.